This may look like just another rock, but its so much more than that. It’s also a storage unit for carbon emissions—and it could finally give us a way to backtrack a bit on what we’ve done to our climate. A new study out today in Science details the protocol followed by a team of researchers at the University of Southampton to turn carbon emissions into rocks. The team took carbon emissions from the atmosphere, dissolved them in water, and sealed them in an underground well in Iceland with basalt rocks. Over the course of two years, the carbon solution reacted with the basalt, eventually crystallizing into these carbon storage rocks. The storage method has some obvious advantages. Previous studies of carbon capture had looked at ways of pulling emissions from the atmosphere and storing them as a gas or liquid. The problem, however, is that they’re unstable and prone to leaks. By storing them in the form of a solid, that problem is eliminated. There are also some pretty clear limits to what the technique can do, at least so far. Researchers used a single deep well in Iceland, with plenty of surrounding volcanic activity. The high-percentage of basalt in the rock (at some places up to 90 percent) was key to the technique. To replicate it, they would need to find similar types of areas, but on a much, much bigger scale. Researchers are optimistic that they could find similar areas. 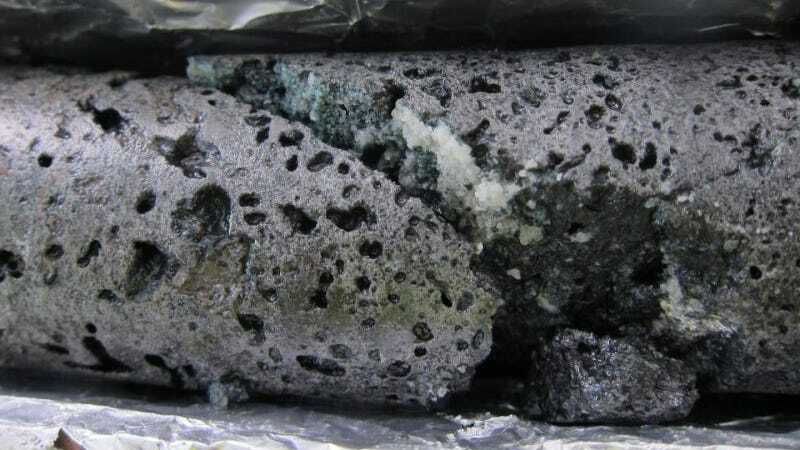 “Basalt is one of the most common rock type on Earth, potentially providing one of the largest CO2 storage capacity,” lead author Juerg Matter noted in a statement. The research, which was funded by the Department of Energy, is part of a bigger movement by the agency to look at ways of capturing and sequestering the tons of CO2 the world is releasing into the atmosphere. The agency estimated recently that the U.S. had the resources to potentially store up to 2,400 billion tons of carbon emissions. But the question of how to do that is still unclear. While storing carbon in solid form is potentially more stable, there are still risks. Professor Zhiyong Jason Ren, who directs the University of Colorado’s Bioenergy and Bioresource Recovery Lab and was not involved in the research, stressed how important it would be to choose the right kind of site for the method. The next step for the research team is an attempt to test a larger-scale carbon rock formation in a carbon capture program at a geothermal plant in Reykjavik, which stores 5,000 tons of carbon a year. Of course, we’ve pumped over 2,000 billion tons of carbon emissions into our atmosphere since the industrial revolution. Even if researchers crack the 5,000-ton problem next, we’re still a long ways away from a fix.